Chelation is a fundamental energy healing technique that charges, balances and clears both the energy field and the body. It’s an invaluable skill for every healer, no matter your background or how experienced you are in the healing arts. 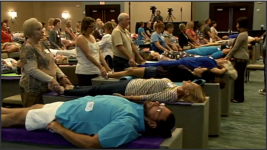 In this five-part video series, you’ll see dynamic energy healing at work in this rare collection of footage hand-selected from Deborah’s most popular in-person workshops. Watch as she uses ancient chelation techniques to clear, balance, and charge the personal energy field for a variety of issues and challenges that many people face. 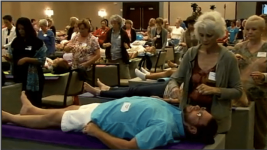 As you watch these transformational demonstrations, you’ll feel Deborah’s healing energy just as if you were attending her workshop in person. Practice along with Deborah and her students and learn the art of Chelation – then practice it on your friends, family and perhaps one day, your clients. In this lesson, Deborah provides an overview of what this ancient healing technique is, and the basics of how you can use it on your clients (and even pets), and why sometimes performing a chelation on friends or family can be difficult. In this lesson you’ll learn even more techniques including how to determine your dominant healing hand, how to use a pendulum during a chelation and why it all starts at the feet. In this lesson you’ll put knowledge into action as Deborah leads group exercises and answers audience questions about chelation, meditation and sutras. Learn everything you need to know about chelating the lower chakras and watch as Deborah performs even more techniques you can use on clients. This final lesson brings you more demonstrations of higher-chakra chelations, helpful tips from Deborah and you’ll even witness a powerful initiation of spirit. If you’re attracted to this kind of learning, or you’re curious to see energy healing in action, this fascinating video series is exactly what you need.